This class isn’t just a collection of warmed-over material from the 1960s, and it’s not some half-baked adaptation of autopistol techniques. Threat-Centered Revolver brings the wheelgun into the 21st century and gives you up-to-date information with modern teaching methods. The result are skills that are easier to learn and easier to recall when you need them most. Of course Phoenix is a great place to hold this class. Aside from the world-class range at the Ben Avery Shooting Center we’ll have Arizona’s famous climate. When it’s wet and cold wherever you are, Phoenix is usually sunny and warm. I can’t think of a better place to learn new skills! 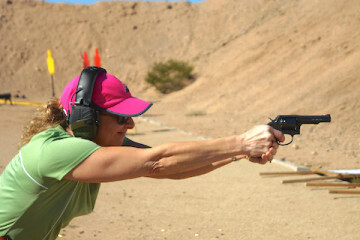 Just click here to go to the Phoenix Firearms Training signup page for Threat-Centered Revolver. I’m looking forward to seeing you in Phoenix the first weekend of April! P.S. : My newest book, Protect Yourself With Your Snubnose Revolver, officially goes on sale tomorrow! It’ll be available in paperback, Kindle, and iBooks formats! Hey Buddy!, I found this information for you: "Just Added: Threat-Centered Revolver in Phoenix!". Here is the website link: http://www.grantcunningham.com/2017/01/just-added-threat-centered-revolver-phoenix/. Thank you.